Michael Schmidt, Ein-heit (U-ni-ty), 1991–94, gelatin print, 20 x 13 1/2”. GERMAN PHOTOGRAPHER MICHAEL SCHMIDT died on May 24, 2014 after a long illness. He will be remembered by his friends for his great warmth and loyalty, as well as for his uncompromising honesty and utter lack of sentimentality. “Life is not a holiday,” he liked to say. He was a very serious guy, but he had a robust sense of humor—a big smile and even bigger laugh. He will also be remembered by his peers for his dedication to his work and to theirs, and for his affecting brand of high ambition stripped of the even slightest pretense. “I am the best photographer in the Wartenburgstrasse” was another refrain, and nothing pleased him more than a strong new body of work made by a friend. Schmidt will be remembered above all for photographs and books rooted in his native Berlin. He was born there in October 1945, just shy of five months after the end of the war in Europe. “The pre-natal period was very important,” he insisted. So, too, was the location. He was born in what would become West Berlin, but when he was a child his family lived in the East for several years before fleeing back to the West. Schmidt started out as a cop (it’s what his parents wanted) and learned photography on his own in his early twenties. In 1969 he began teaching photography at the Volkshochschule (adult education center) in his neighborhood of Kreuzberg, and at the center in 1976 he founded the Werkstatt für Photographie (Workshop for Photography). That same year, Bernd Becher was appointed professor at the Düsseldorf Art Academy, which dwarfed the Workshop in scale and prestige, and the art world soon became obsessed with photographic doings in Düsseldorf. But during Schmidt’s five years of involvement with the Workshop it was a beehive of impressive visits and/or exhibitions by the likes of Robert Adams, Lewis Baltz, Larry Clark, William Eggleston, John Gossage, and Stephen Shore. It is extraordinary that a neighborhood community center was among the first and most active institutions in Europe to embrace the vitality of postwar American photography. Meanwhile, Schmidt in his own work was applying the lessons of American work to his deeply personal experience of his battered and divided hometown. His early books were devoted to the Berlin neighborhoods of Kreuzberg (1973) and Wedding (1978) and to the city and its inhabitants more broadly (Berlin: Stadtlandschaft und Menschen, 1978). The photographs are as brittle and unadorned as Robert Adams’s early pictures—minus the bracing sunshine of the American Southwest—and the new buildings seem just as grim as the city’s nasty scars. The pictures nonetheless convey familiarity and affection—and a weighty regard for the inhabitants. Berlin nach 45 (Berlin since 45), the strongest of Schmidt’s early series, was photographed in 1980 but not published until 2005. Pristine pictures devoid of people survey a cityscape whose bombed-out lots remained barren after the Wall went up in 1961. Here, Schmidt’s steady gaze often met the blank firewalls of buildings that were half their former selves, and the stripped severity of the photographs slices like a sharp knife. Despite the nominal reserve of the images, Schmidt’s emotion enters our hearts through our eyes, as it would again in a series titled Waffenruhe (Ceasefire) that he began in 1985 and published in ’87. Here, reserve gave way to high pictorial drama: Extreme details, croppings, overlappings, disparities of focus, and somber tones transform drab and ugly patches of the city into monuments of funereal pain. And though many of the pictures are fragmentary, murky and cryptic—as if it hurt Schmidt to look—there’s no question that the main subject is the Berlin Wall. The stylistic evolution of Schmidt’s work from the early ’70s to the mid ’80s was remarkable. Perhaps still more remarkable was the passage that led from the expressionist immediacy of Waffenruhe to the dense, complex, and demanding Ein-heit of 1996. The single German word broken in half signalled Schmidt’s skepticism toward Germany’s euphoric rush to reunification in 1990—a message unfortunately diluted by the English title U-ni-ty. About half of the book’s 163 photographs are by Schmidt; the rest are his photographic copies, often decisively cropped, of images from newspapers, magazines, propaganda magazines, and the like. The deliberate, poetic sequence simultaneously evokes the painful complexities of German history after 1933 and interrogates the reader, who is obliged to interpret the uncaptioned images and the implications that arise from the sequence. Among photobooks, Ein-heit is at once the most creative response to Walker Evans’s American Photographs since Robert Frank’s The Americans and a wily embodiment of postmodern sophistication. 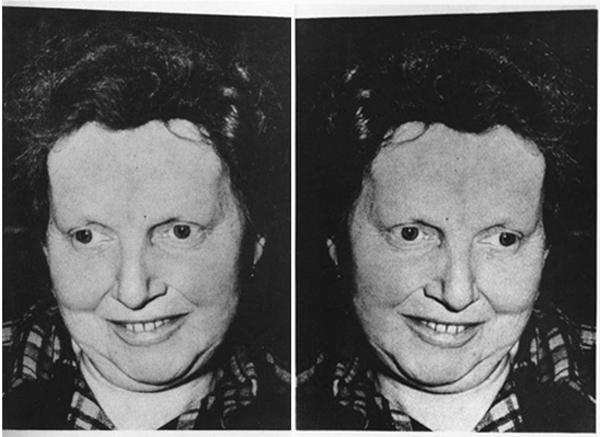 After Ein-heit, Schmidt stopped photographing in Berlin. He went on to complete valuable projects on women (Frauen, 2000), provincial Germany (Irgendwo, 2005), and the food industry (Lebensmittel, 2012, for which he was awarded the Prix Pictet three days before he died). But his most important and lasting legacy is his sustained, artistically vital, and deeply moving engagement with his native city. Peter Galassi is a scholar and curator whose principal fields are photography and nineteenth-century French art.